The copy data feature allows you to copy response data from one survey to another. This is useful if you have had multiple surveys running and you want to consolidate all your data into a single survey for reporting purposes. Data can only be copied if the structure of the questions are the same. Please note that data can be copied even if the question is not exactly the same. For example, you can have two rating questions with different question texts, but with the same number of rating values, say 1-10. Before data is copied, Opinio only verifies that the structure of the questions are identical. Texts, images and labels may differ. It is up to you to make sure that the questions in the surveys that you copy from/to are actually semantically equivalent. If some of your questions in the surveys are different in structure, you can still copy data from one survey to another by excluding the mismatched questions. From a folder view, click the copy data action button for a survey. The screen will show a list of the questions for that survey (source survey) on the left. 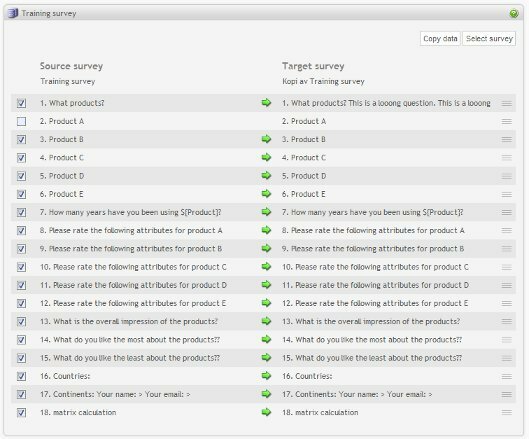 On the right hand side, you can select the target survey, which is the survey that receives data from the source of survey. Navigate and and select that survey. If you know that any of these questions (now displayed side-by-side for source and target) are not of the same type or are structurally different, deselect these questions from the list. It is also possible to reorder the question list for source and target (or both) to match up compatible questions. Do this by click-hold and drag questions up or down. It is also possible to switch the source and the target, by clicking on the arrow icons. Once compatible questions are selected, click the "copy data" button. If any of the questions that you have included does not have the same structure (incompatible), the data copy process will not start. Opinio will indicate (with icons) questions that cannot be copied. If all are compatible, the process will start. Once started, you can go to the survey status screen and verify that the number of respondents is increasing.